Our field trips provide an opportunity for children to see and learn about a working certified organic farm and to discuss important social and ecological aspects of food production in our area. Every year from spring to fall, the UBC Farm offers field trip programming for a wide range of young audiences. 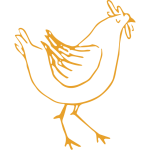 Join us to learn about bees, explore the forest, examine soil or compost, and even visit the chickens! Our FarmExplorers field trips invite children from 2.5 to 5 years old to engage with the UBC Farm environment through their five senses. Observe which vegetables are growing on our farm in the season of your visit. Observe a variety of seeds and plant your own seed to take home or to school! Learn what a plant needs to get off to a great start in the beginning of its life. Meet the wiggly farm residents that help us recycle food scraps into healthy soil. Learn what goes into compost and what does not and why this is important! Our bees are busy, but do you know what they are so busy doing? 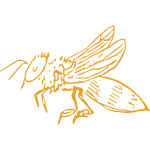 Learn bee etiquette to safely observe honey bee hives and native bees at work around the farm. Interpret a waggle dance to find “nectar” like a honeybee! Take some time to connect with our beautiful 100-year-old forest. Find a solo spot to sit and experience your surroundings through sight, sound, smell and feel. Get introduced to some of our most common native plant species. FarmFundamentals Field Trips consist of brief introductions to various food production sites and education stations throughout our 24-hectare farm. Students go in depth about the topic of your choice with engaging activities. Interpret resources to identify which plants can be started in each season and plant a seed to take with you. Take a tour of our established Children’s Learning Garden to get inspired for your own projects. This program is ideal for groups who have access to a garden space and would like to have students equipped with the knowledge to take initiative in these spaces. Our bees are busy, but do you know what they are so busy doing? 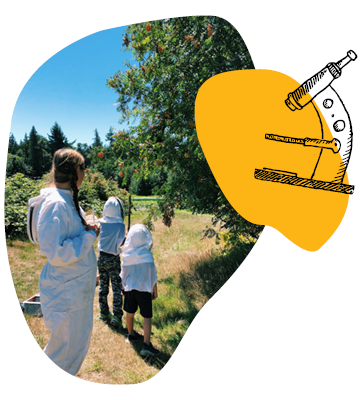 Learn bee etiquette to safely observe honey bee hives and native bees at work around the UBC Farm. Take a trip to our honey bee hives to see what they are up to and play a game to better understand the process of pollination. Finally, learn some of the things you can do in your own backyard to help these important critters. Did you know over half of the UBC Farm is forest? Learn the ways in which the forest helps the farm grow strong healthy vegetables and more about the relationships between these two environments. Identify common native plants and play a game that engages your senses of touch and scent to differentiate trees. The UBC Farm welcomes secondary students to engage in critical discussions about our food system and the land where we live and study. Groups can choose between the three field trip themes offered below. Discussions about food security, farmland protection, and the Agricultural Land Reserve, organic farming and more come to life with youth who are excited to explore food, land and ecological issues. Learn the basics you need to grow a garden at home or at school. Interpret resources to identify which plants can be started in each season and plant a seed to take with you. Observe our established Children’s Learning Garden to get inspired for your own projects. Did you know that out of a total of 24 hectares, over 12 hectares of UBC Farm is forested? Experience the sights, sounds, and smells of our coastal rain-forest and learn about a few of the many ways our farm and forest are connected. Your field trip guide will lead you through a variety of activities to engage critical thinking and a variety of senses. All field trips include some walking to various features of our working organic farm. Choose one of areas above to focus the activity components of your field trip experience, and come back for another to see how our farm changes through the seasons! Weekday field trips are mornings 9:45 AM – 11:45 AM or afternoons 12:15 PM – 2:15 PM. Available dates are listed through our online registration. Available dates are listed through our online registration. Field trips can be shortened by up to half an hour to allow more travel time. Please include a note in your comments during registration (standard fees apply). If you are hoping to stay later or begin earlier, please email us at ubcfarm.farmwonders@ubc.ca to see if our guides can accommodate your request. Field Trips may be booked on Saturdays or evenings. 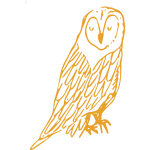 Please email ubcfarm.farmwonders@ubc.ca to request a booking. Our Field Trips are $5/child for groups of at least 15 children or $75 for a group of fewer than 15 children. For every five children attending, one chaperone may attend for free. In the unlikely event that a tour must be cancelled, all fees for a cancelled program will be refunded, or participants will be given the option of rescheduling the tour. If you cancel more than two full business days before your scheduled tour, we will refund you for amounts over $30. If you cancel your tour less than two full business days in advance, we regret that we are unable to offer a refund. You will be billed for the booked tour. The only exception to this is in the fall if we are able to resell prepaid pumpkins to another group. Cancellations must be phoned in to the shared phone line at the farm at 604-822-5092 (24 hour voicemail). Have more questions? Visit our Children's Program FAQ.